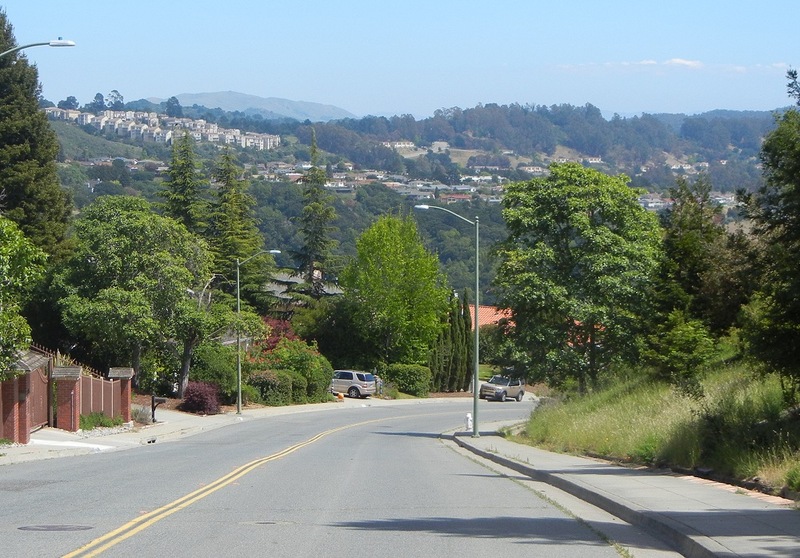 The Caballo Hills is the neigborhood flanking Merritt College on the Bay side; it consists of Campus Drive and the Ridgemont development. It’s geologically monotonous, underlain entirely by Leona “rhyolite.” And while all the roads have sidewalks, it’s a steep and exposed hike. Nevertheless the area is highly scenic, and I walked it in the course of a few separate visits this spring. Let’s start with the map. It shows that essentially all the homes here were built on graded lots, removing whatever soil was there. 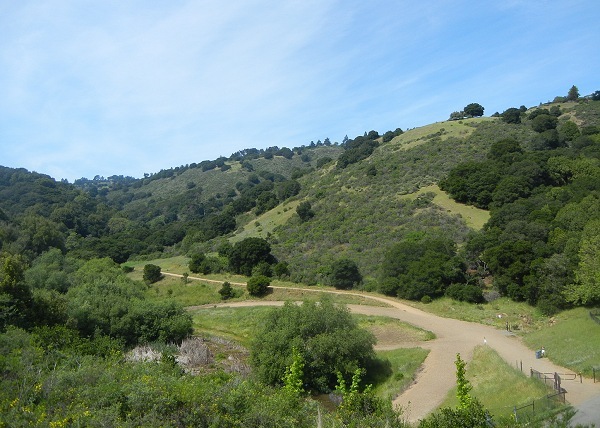 I guess the original vegetation was scrub like that on Sugarloaf Hill, the high knob in the Leona Canyon Preserve. Now it’s mostly bare rock. 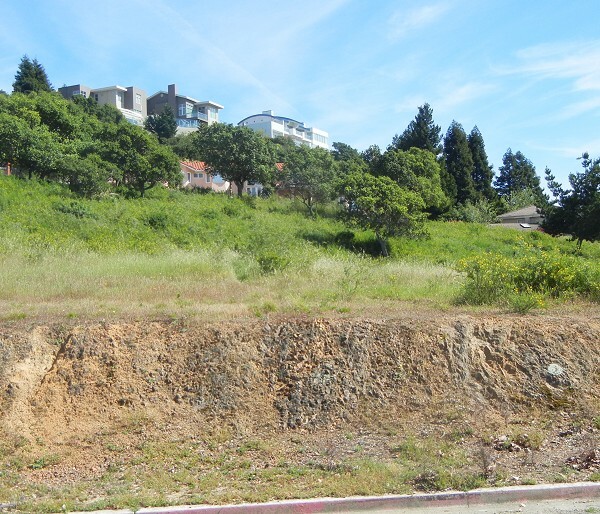 Here’s a typical example, a roadcut on the Merritt College campus. And here’s another farther down Campus Drive. So seeing interesting things underfoot is not easy as you visit this area. The “rhyolite” is not a stratified rock—you won’t see bedding, or fossils, or sedimentary features. However, its rusty butterscotch color is very even and pervasive. This is caused by the presence of iron oxides, which are steadily being released from the rock, probably from pyrite and other metal sulfides being oxidized in the presence of air and water. That’s why this bedrock exposure caught my eye at one spot. It features little pockets of intact pyrite that were exposed by the developers’ excavators. 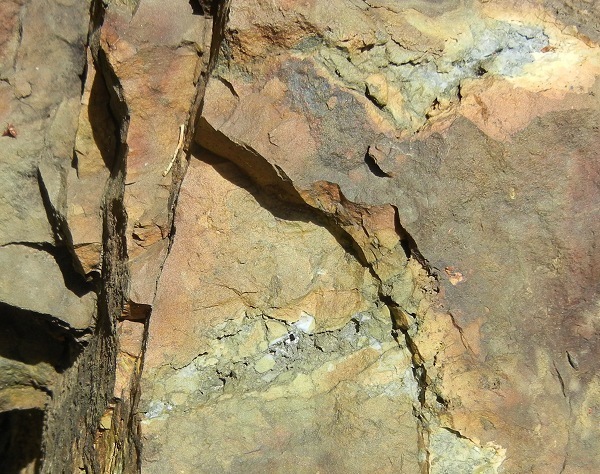 The Leona Heights sulfur mine exploited this same rock unit, and you’ll see similar pyrite pockets in the rocks exposed there, at the end of McDonell Avenue. Outside the mine area, the rest of the “rhyolite” probably weathers slowly enough that sulfuric acid from the pyrite oxidation is neutralized with no problem. 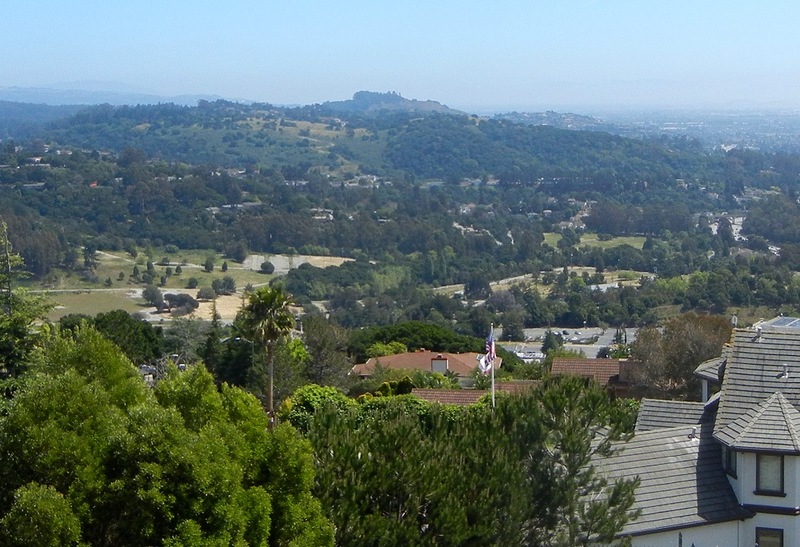 But lift your eyes off the ground and the best part of this neighborhood reveals itself: the views. I surveyed the Ridgemont end on a cloudy day in April. Here’s a look at the northern end of Ridgemont Drive from the parking lot on the western edge of the college. And this is looking back up from there. It’s beautiful land. Would be nice if Leona Heights Park could take up some of it. 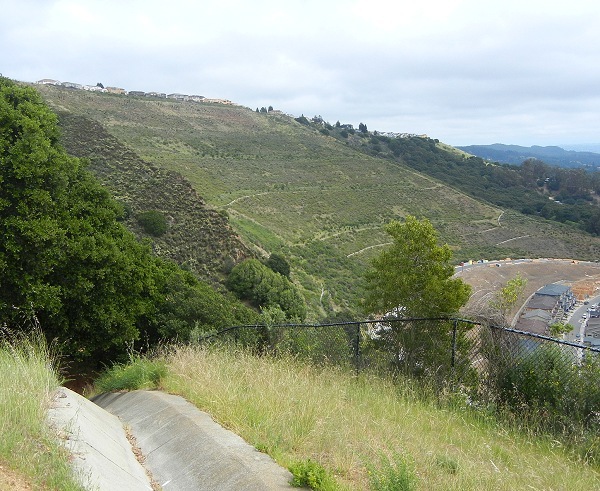 The south end of Ridgemont overlooks the former Leona Quarry and the uppermost catchment of Chimes Creek. I surveyed Campus Drive a couple weeks later on a sunny day, which made the hike harder but offered better views. This view is to the southeast (it’s 1000 pixels, click and enjoy). 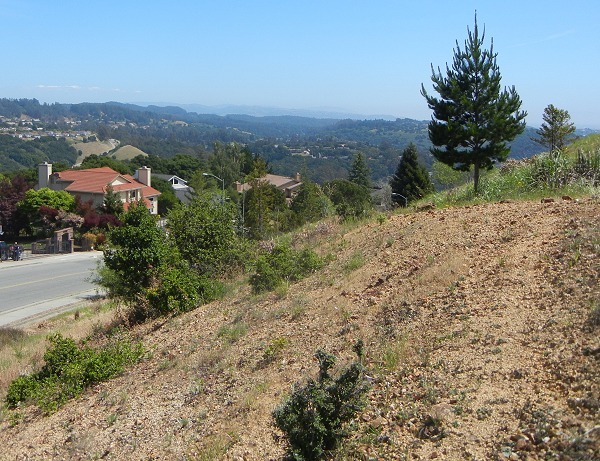 The high ridge in the back appears to be The Knife, an eminence overlooking San Ramon about 8 miles away that reaches over 1800 feet and consists of the Briones Formation. 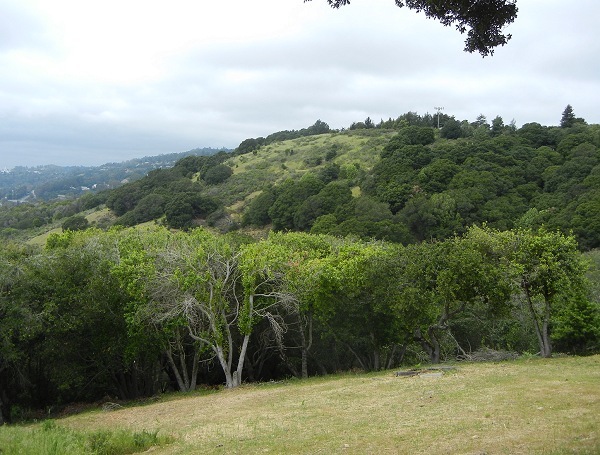 And this view (also 1000 px) looks right over the old Oak Knoll grounds and Knowland Park hill to the 800-foot peak of Fairmont Ridge. 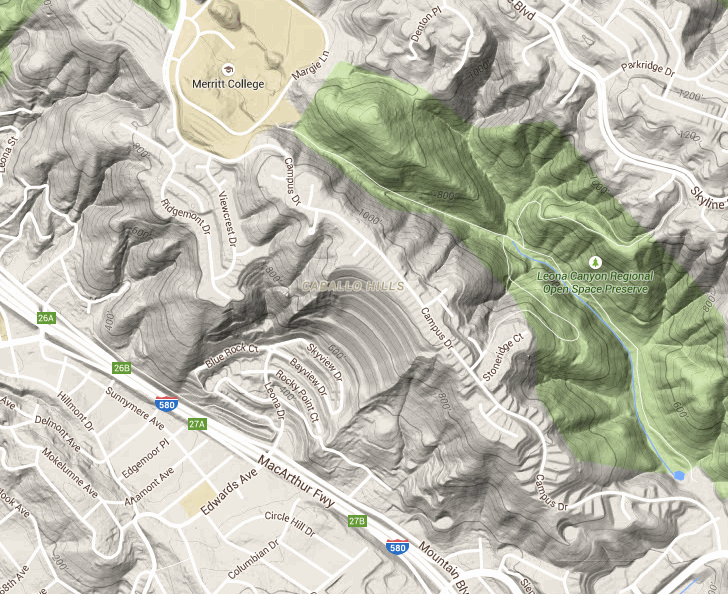 Down at the southern foot of Campus Drive, you get eye-soothing views of Leona Canyon. This city is just gorgeous. 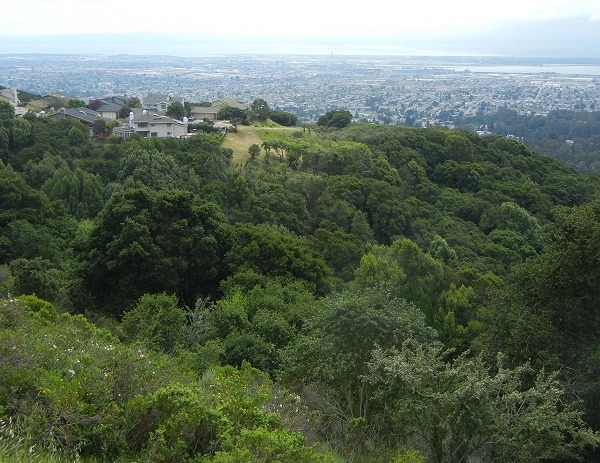 This entry was posted on 20 July 2015 at 8:02 am and is filed under Leona volcanics, Oakland geology views. You can follow any responses to this entry through the RSS 2.0 feed. You can skip to the end and leave a response. Pinging is currently not allowed.